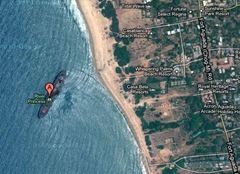 MV River Princess, a grounded merchant vessel in the year 2000, that remains as an environmental hazard to Goa coast is finally getting ready to be removed from March 05, 2011. MV River Princess, 240 metre long ore carrier of M/s Salgaocar Mining Industries Ltd ran aground off the Candolim-Sinquerim coast of Goa on June 06, 2000 due to rough weather. The vessel in addition to being an environmental hazard, has also become a transit point for drugs. Due to prolonged public protest, on September 08, 2010 the high court of Bombay at Goa, directed the state government to commence work on removal of MV River Princess, within two months from that date. Arihant Ship Breakers of Bhavnagar, Gujarat are now getting ready to cut and remove MV River Princess.